Alright; now I know that picture doesn’t seem to have much to do with eating, but this is where the largest chunk of my money goes every month living outside of the city and working in it. Commuting. 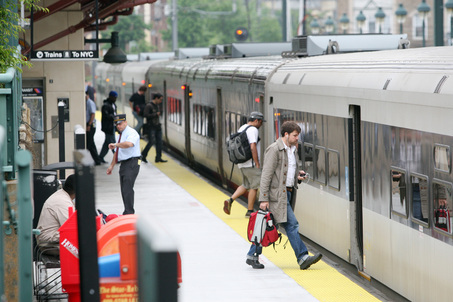 I’ve only worked at my new job for a little while, but I can tell you that it costs $400 per month to catch the train in, which is twice what I used to pay to put gas in my car every week. It’s a good thing I make more than I used to, but that doesn’t mean money isn’t tight. Now, I know what you’re thinking – I’m going to tell you to bring food with you instead of buying in the city. And yes, depending on where you work or live, that is exactly what I’m going to tell you. I work in Midtown Manhattan, and I see food advertised all the time – $8 here, $12 there. It is almost twice what it costs in my hometown here to get the same cup of Starbucks for pity’s sake! (Needless to say, I don’t even have the occasional cup anymore xD) Now, if you have been following my sparsely updated YouTube channel, you know that I’m really into taking my lunch to work, even before I moved to the Big Apple. But, the biggest question is, how in the hell do you get all that food (and I do mean all of that food; I take enough to get me through 12 hours) into the city, down the street or in the subway, up the stairs, and into your office? 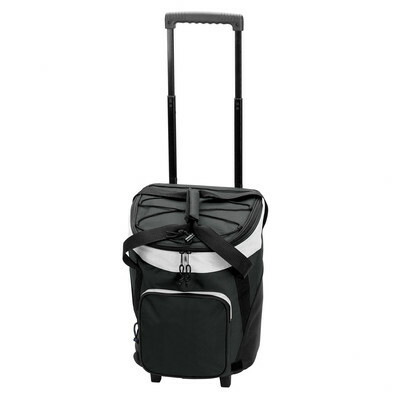 This isn’t the one that I have, but it is a cooler on wheels that you pull like carry on luggage. This baby easily fits a bento along with four or five Tupperware containers, water bottles, and cool packs. I even have a blanket and pillow I wrap up and stick in here so that I can sleep on the commuter train (since I have to get on a 7am train to get to work by 9, and I don’t get off the train again until 7pm) and be a bit more comfortable while I’m doing it. And, it really does fit everything I want to bring for food, so I don’t need any snacks or lunch or anything. Then, I just eat at home, and I am all set for food – no expensive purchases during the day, and I stay full and happy as a bonus! Today I have red grapes, hummus, carrots, pita, mini bell peppers, a bagel, and dates, and since I drink a smoothie in the morning on my way to/on the train, that usually lasts me literally all day until I get on the train at night. Just eating when I get hungry really cuts down on how much I eat as well, instead of starving until lunch or the train ride home and gorging on whatever I can get my hands on. So yeah; fun tidbit for living in NYC; invest in one of these little babies, and you will never have to buy expensive meal foods in the middle of the business district again! Let me know if you want more of these, or if you want me to see if I can scope out less expensive places in the city to eat at? I’ve been thinking about it,b but I don’t know … let me know your thoughts!